Do you ever wish you could show visitors which of your members are local to them — without having to manually add them to a map? Or that you and your members could see at a glance which neighborhoods fellow members are based in? Searching through your directory to find local members can be time consuming, and can make it hard for fellow members and website visitors to find the right people to contact. That’s why we added the new members location mapping gadget. This gadget pinpoints the locations of your members on a map, and shows selected member details when you click. This can help visitors to your site to find the best person to contact within seconds, encourages your community to get in touch with each other, and make it easier for admins to organize your members. If you're looking for something specific, you can skip ahead to a section by clicking it in the list above. Choose which members to show, by level, group or saved search. Choose how detailed your member locations should be, e.g. country, town, or street address. Choose which member details show in the pop up, e.g. address, phone number, or email address. Change the appearance of the map gadget, by choosing its size, margin width and placement, or using CSS code. Visitors can use the map to quickly see which of your members is most convenient for them to connect with. This can be particularly helpful if your organization is a professional association, or works with healthcare, education, or other service providers. Members can use the map to communicate with other members in their area more easily, setting up networking or community activities. If the map is made public, it’s also easier for potential customers or clients to get in touch. Admins can use the map to identify which members are relevant to contact with location-specific events or updates. No more time wasted manually updating maps! If you're still not sure if members location mapping will be a good fit for you, take a look at this post of 4 tips to tailoring location mapping to suit almost any organization. 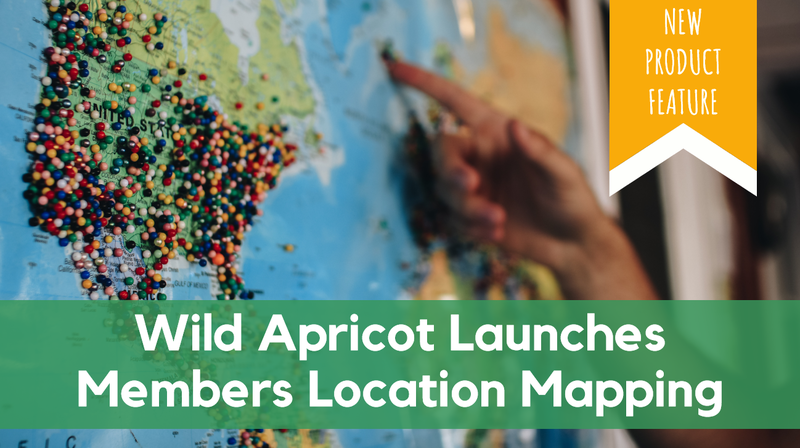 For more ideas and real life examples of how other Wild Apricot customers are using members location mapping, see this post. To start using the members location mapping gadget, you’ll first need to sign up for a Google billing account and get an API key — a code that will allow your website to communicate with Google maps. You can find detailed click-by-click instructions on these steps by clicking here. Once you have an API key, you can add the location mapping gadget to any page of your website — just drag and drop the gadget onto the page and paste your API key into the settings menu. Which members you want to display, according to level, group or saved search. Which address fields will be used on the map. For example, if you don’t want to show members’ exact addresses, you can choose to only locate them by country and town. Which fields to display for each member, including name, address and phone number. You can find full instructions on how to complete these steps on our help site. It’s likely that something isn’t matching up in the integration. Check that you entered the URL correctly in the HTTP referrers section when setting up your Google API key. Click the link to the Google Platform Dashboard in the gadget menu. Copy your API key again and paste it into the gadget settings menu on your site. You may have to select your Member address fields and Pop-up window options again. It might take a few minutes to reload the data to your map. If you’re still seeing the error message, there are more support options and information available via your Google Cloud Platform dashboard (where you created your API key). Is there any cost for using the Google API? If I add a member, do I need to add them to the map? You don’t need to take any action — if the member is in a level or group that has been selected to show on the map, they will be automatically added. It can take a few minutes for a new member to show on the map. How can I restrict who has access to my members’ details? If a member has their privacy settings set to No access, they will not be shown on the map. For users who have given access, your organization’s administrators can control which types of members are shown on the map and what information is included by selecting these options in the settings menu. If you only want to add specific members to the map, first create a list of these members as a saved search, then in the settings menu of the map gadget you can select to only show this saved search on the map . If you want to restrict who can view the map, you can restrict access to the page where the gadget is shown. Why are my members not appearing or appearing in the wrong location on my members location mapping gadget? Make sure that the members you chose to include on your map are permitted to access the selected address field(s). If you choose an address field that is not available for your selected membership level(s), those members might not appear on your map. Select only geographic fields like address, state/province, country, postal/zip code, etc. Selecting other types of fields – like organization or phone number – may confuse Google and produce strange results. When address information is unavailable for contacts, leave the address fields blank instead of entering something like n/a. If you have any questions, or need help setting up location mapping, feel free to get in touch with our support team.